Jen Baumgartel opted for in-vitro fertilization after learning from a Counsyl test that she and her husband were carriers for the severest form of Smith-Lemli-Opitz syndrome. For cynics who say that Silicon Valley has become too mired in photo-sharing apps and addictive games, take a 15-minute drive to South San Francisco. In a non-descript lab is a company that may be paving the way for the Valley’s next wave of disruptive startups, which marry software with data from the human genome. Counsyl is doing genetic tests that look for more than 400 mutations and at least 100 genetic disorders for parents who are planning children. At $599 total, or $99 with insurance, their tests cost a fraction of standard ones, which often only look for a single condition like cystic fibrosis, and run anywhere from $100 to $500. A full panel of tests for Ashkenazi Jews, a minority famously at risk for various genetic conditions, can run about $4,000 to $5,000 from companies like Quest Diagnostics. Founded six years ago, Counsyl has grown to handle carrier screening for 2.5 percent of all births in the U.S.
To ramp up, Counsyl has quietly taken in roughly $65 million in funding from firms like Founders Fund, Felicis Ventures, India’s Manipal Group, Google’s senior vice president of corporate development David Drummond, WTI, Rosemont Seneca, and Google research scientist Jeff Dean. The company is coming of age at a time when the costs of full-genome sequencing are falling faster than even Moore’s Law would have predicted. Full genome sequencing — not the kind of testing where you’re handling only select snippets of DNA — runs at around $8,000 now, down from $100 million in 2001. Capitalizing on this, Counsyl has products for both SNP tests and a more comprehensive sequencing test that is about $999 for 10,000 genetic mutations. It’s helped women like Jen Baumgartel, a nurse in a Nashville, Tennessee in vitro fertilization clinic, choose IVF over conceiving naturally. 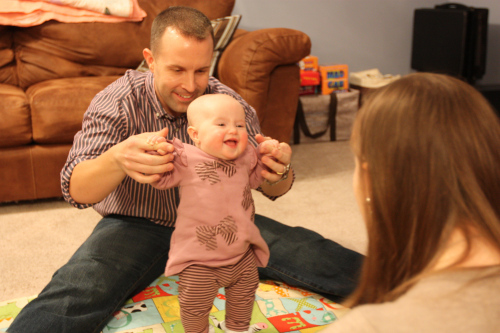 Through a Counsyl test, she found out both her and her husband were carriers for Smith-Lemli-Opitz syndrome, which put their potential children at risk of heart problems, developmental delays and cleft palate. They had a one-in-four chance of passing the condition on, and both Baumgartel and her husband carried the genes for the severest form of the disease. They ended up spending around $12,000 on in-vitro fertilization and now have a healthy nine-month-old baby girl named Kinley Jo (pictured at the top). Unlike the consumer software world where costs of starting a company have fallen precipitously over the last five to ten years, bioinformatics may only be at the beginning of seeing a similar drop. While other founders tapped into the big social networking and mobile app trends of the last five years, Srinivasan instead went for higher-hanging fruit. Before the market peaked in 2007, he was working on equity research for Morgan Stanley alongside famed analyst and now Kleiner Perkins partner Mary Meeker. Like many entrepreneurs who come to the Valley from the banking and consulting worlds, he was looking for tangible work with more meaning. From across the country, he saw how old classmates from Stanford were building companies. Srinivasan’s brother Balaji, is one of the company’s other co-founders. When Counsyl was founded, he had just finished a Ph.D. at Stanford in electrical engineering and was teaching and doing research around computational biology. The pair had never worked on a company together before. Srinivasan said the way founders approach problems in the Valley is almost like an inverted Maslow’s pyramid. Products that are about self-expression like social networking apps get the most attention from young founders, while businesses that are about more basic needs like health or financial security are under-addressed. Founders get intimidated by the regulatory risks and by the deep subject matter knowledge that you might need to attack the health, financial or legal industries. “Bright people in Silicon Valley aren’t necessary focusing on health because the speed of iteration seems slower,” Ramji said. Yet Counsyl has managed to deal with the steeper capital costs of doing biotech startup and captured a meaningful share of the carrier screening market. While they don’t say the number of tests they do per month, they do admit that they’re handling 2.5 percent of all births in the U.S. The CDC reports 4 million U.S. births per year, so one could infer that they’re doing at least 100,000 tests annually. The tests themselves are easy to administer. Couples get the testing kits from their doctors, send in either a blood or saliva sample, mail it to Counsyl’s lab and then get results back in two or three weeks. Results come in a couple color-coded pages that show a couple’s numerical risks for having children with any of more than 100 recessive genetic diseases. A refashioned car-painting robot that’s being used at Counsyl to handle trays of samples. Counsyl’s price advantages over competitors are not really about any single transformative change to genetic testing. It’s more about correcting inefficiencies at every step of the way. Counsyl built image processing software that cut down on common testing errors by a thousand-fold. They creating billing infrastructure when it was too complicated to deal with the 700 insurers that pay for Counsyl tests. They created an iPad app for doctors so it would be easier to order tests and fit Counsyl in with their daily workflow. They refashioned a robot arm that’s normally used to spray paint Toyota Prius cars to handle trays of samples without requiring human intervention. They created their own wetware and had to re-engineer some chemicals from scratch when they realized they couldn’t rely on third-party labs to handle their samples properly. They found a space, started ripping out its carpets. Srinivasan bought a Home Depot book on plumbing. It was costly and tedious, but it yielded unexpected benefits. Once they went forward with the lab and could see a path toward scaling easily, other investors stepped in. Founders Fund, which has backed companies like Tesla, SpaceX and Facebook, came in during 2011. Now that the hardware and wetware sides of the business are more manageable, Counsyl can focus on its true opportunity: interpretation and curation of genomic data. As the wealth of data grows, Counsyl is building a scalable and repeatable system for interpreting DNA readings. If one were to take all of the published research papers associated with all of the mutations that Counsyl tests for, it would take five work years to read them all. So Counsyl is creating rule sets for how to understand what different mutations mean. Deletions or insertions into a person’s DNA can be quite serious, but there are also minor mutations that might not affect amino acids produced from the DNA. On the consumer-facing side of the business, Counsyl’s near-term progress will be about expanding deeply into the carrier screening market. Eventually, they want to build a mainstream brand with lots of applications. “Philosophically, we want to build a consumer brand. We want people to associate us with understanding the genome the way people think about Kleenex with tissues,” Ramji Srinivasan said. From that point of view, carrier screening is an ideal starting point. Parents are strongly motivated to do their best for their future children. Not only that, timing really matters for pregnancies and childbearing. If customers end up having a good experience with Counsyl products early on, they’ll develop a trust or affinity for the brand, which will help later down the line with future services. This is unlike other genetic testing services, which focus on predicting diseases a person can contract in old age. The issue with that market is that people have a tendency to push off or procrastinate on testing for potential bad news. The other issue with testing for conditions in old age is that there is an inverse relationship between how predictable and how actionable these diseases are. With the most predictable genetic conditions, there might not be much that a person can do to change their fate. But conditions that are more behaviorally or lifestyle-influenced like heart disease are not all that accurately forecast by genetic tests. Counsyl also tries to be conscientious about the murky ethical issues that sometimes arise with genetic testing. There are some fascinating questions here for prospective parents. For example, would a couple make a different reproductive decision if they found out that they were carriers for a lifelong condition like cystic fibrosis versus a BRCA mutation that could lead to breast cancer in mid-life? Genomics at Web Scale – Counsyl Tech Talk from Counsyl on Vimeo.